Melbourne played host to the 2nd International Cup, with regional Victorian town Wangaratta also featuring for one round of matches. 12 countries were expected with Spain the fresh faces, but funding and player availability saw Denmark and Nauru as late withdrawals, reducing the total to 10. Papua New Guinea again made the final, but went down to New Zealand. Below are links to key details for the event. WFN reported on every game and the complete archive can still be found below, in reverse chronological order. If further stories do not appear below, click here. We're happy (or should that be guilty) to say that nearly three years since the end of the 2005 Australian Football International Cup, we've finally completed editing and uploading our "home video" footage of the tournament. We did of course release snippets around the time of the last Cup, but have been uploading more over the last six months. The final instalment includes a few shots from the Grand Final at the MCG including some of the New Zealand celebrations down in the rooms after the game. We'll endeavour to make such footage available much quicker during and after the 2008 Australian Football International Cup, however there's no substitute for professionally recorded video as provided by the AFL last time - we'll certainly be encouraging them to make some of it available to the public far quicker than having to wait for copies to appear years later. Early signs are good, with AFL staff starting to collect some preliminary footage already. Or simply visit the World Footy Channel embedded player. 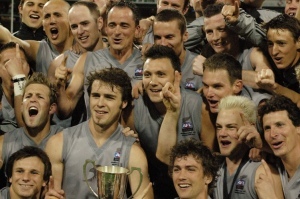 Looking back at some of our footage from the 2005 Australian Football International Cup semi-finals, it's a reminder that it may still be tight at the top of international footy come the third Cup in August this year. We'll be looking to stir up the debate later in the year, but already there's plenty of opinion that Papua New Guinea should be the stand-out. With so many players now at a high standard in the AFL Queensland leagues, it seems quite possible that PNG will be far too good for everyone else. On the flipside though, watching back some of the Mosquitoes' dogged battle with Ireland in the 2005 semi-final, there must be some hope for other nations. Like many countries, Ireland didn't have their best possible team at the Cup, yet in their match against PNG, with a bit of luck, they could have gotten over the line, losing by just 9 points (and having one more scoring shot). Similarly the US Revolution's match against PNG went to the wire, the Stars and Stripes falling just one point short, and ultimately losing to the tournament winner, New Zealand, in their own semi-final. Of course New Zealand were the stand-out side in 2005, undefeated at the Cup and generally winning easily. So perhaps they will deserve to start favourites again. With none of the top 4 having played each other since 2005 one thing is for sure - no country can truly be confident until they've put the score on the board this August and September. Part of the experience of the International Cups and international footy in general is the culture and colour other nations bring to the game. We see different playing styles, different body types, new jumper designs and an assortment of languages and culture. A huge success at the last Cup was the dinner function in Wangaratta. Some of the colour, dancing and good cheer can be seen on our recent Youtube upload on our World Footy Channel. As the 2008 Australian Football International Cup quickly approaches, WFN is continuing to upload short segments of footage from the second Cup, back in 2005. 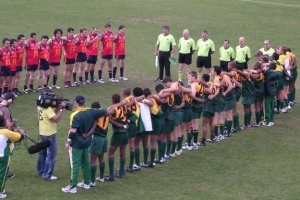 The latest clips include Britain versus Papua New Guinea at what was Optus Oval (Carlton's ground), the welcome to teams in Wangaratta in rural Victoria, and the matches there between Ireland and Japan (mainly Japan's solemn anthem), Britain and Canada (focussed on former AFL player Matt Connell's 3/4 time coaches address to the Bulldogs, and post match celebrations) and the tight United States versus PNG one point result. View the footage on the World Footy Channel. The 2005 Australian Football International Cup received much wider mainstream media coverage than it did in 2002. There was a greater awareness within the media leading into the tournament, and several nations were very adept at grabbing attention, which all helped raise the event's profile. As most of the international leagues finish off for 2005, here is a look back to the Cup as we list just a small number of the many stories from mainstream press that was also available on the internet. The Canadians were unlucky with a tough draw at the 2005 International Cup, but they fought hard in every match. They also presented very professionally and that includes capturing some video of the event, including the PNG Ole Ole. After having reviewed the form of the sides that finished 6th to 10th at the 2005 International Cup, we now look at the top 5 and how they performed compared with predictions. Now that the dust has settled and another International Cup has been decided, it seems timely to review how each country went compared with 2002 and up against expectations. The AFL's Community Development Manager Ed Biggs, who was also Tournament Director for the 2005 Australian Football International Cup, has responded to World Footy News' review of the event - see Opinion: Report card on IC2005 for our article. In his detailed email Ed also mentions the AFL's own review of the tournament and tantalisingly suggests that they hope to see as many as 20 nations competing in 2008. One of the keen spectators at the 2005 International Cup was Kevin Sheehan. He is well known to most Australian Rules fans as the expert clubs and media turn to for guidance when it comes to the annual AFL draft. There is no better person to talk to about the prospects of international players making the big league, and worldfootynews.com did just that during the Cup.